Once a ligament is overloaded and over stretched it is nearly impossible to have it regain it’s original shape. As we get older this is a significant concern and doctors warn of potential damage to ligaments in hips, knees and ankles from over stretching. In addition, many people – young and old – may experience Ankle Pain when using High Angle Inversion Tables. Unfortunately, the downsides of High Angle Inversion Tables are usually not discovered until after a purchase. For some people this “mild discomfort when hanging by your ankles” is not mild can be quite severe – and is COMPLETELY UNNECESSARY. Ligaments are safe, because HIGH Angles are unnecessary, and there is NO ankle pressure – or pain. 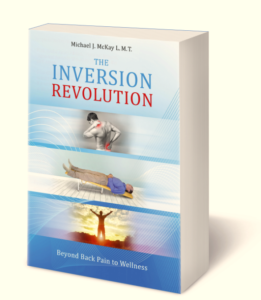 Muscle Guarding is our body’s natural protective response to pain, fear and imbalance – we tighten up – which is the opposite of what we want to happen when we invert! High Angle Inversion Table manufacturers know that it will take time for your body to work up to their recommended 60 DEGREE ANGLE. Many people never get used to it and it is UNNECESSARY. It is counter productive to trigger Muscle Guarding in the first place. It should not be necessary to “work up to” feeling safe and secure. With Gravity Pal you feel safe and secure eliminating muscle guarding. This allows deeper tissue relaxation – immediately. Dr. Edward R. Laskowski, M.D is co-director of the Mayo Clinic Sports Medicine Center and a professor at College of Medicine, Mayo Clinic. He defines inversion therapy as, “HANGING UPSIDE DOWN” at a high angle. Dr. Laskowski then states that doing so “IS NOT SAFE [and] could be risky for anyone with high blood pressure, heart disease or glaucoma. So why is it that many High Angle Inversion Table manufacturers tell you to “WORK UP TO A 60 DEGREE ANGLE” ? That is a really High Angle! On top of that, High Angle Inversion Table Manufactures suggest that 20 to 30 degrees is what they think is LOW ANGLE! Sorry, that is still very high! With Gravity Pal you DO NOT AND CAN NOT HANG UPSIDE DOWN. You are at a MUCH LOWER ANGLE of approximately 13 degrees. Many people find this more tolerable because the impact of shifting fluids has been significantly reduced by comparison. Nevertheless, common sense should be each persons guide. Please read our Notice of Contraindications. Gravity Pal® Low Angle Inversion Tables solves these problems and MORE!